Do you have an insurance plan? Click here. Patients may be covered by their own insurance plans. We are able to bill Sun Life, Green Shield, Great West Life, Blue Cross and many more directly in office. For all other plans, you must pay for the exam and/or glasses and submit the receipt to your insurance company directly for reimbursement. 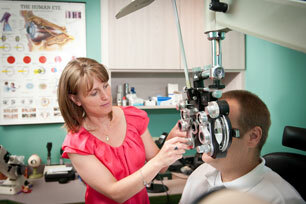 BOC offers comprehensive eye examinations to assess ocular health and vision. An examination not only assesses a patient’s visual acuity and glasses prescription, but may also reveal a variety of potentially treatable eye diseases. Many diseases leading to permanent vision loss, such as glaucoma and amblyopia, may show no symptoms for years, but are treatable if diagnosed in their early stages. Examinations may also reveal a variety of systemic diseases such as diabetes, high blood pressure, and multiple sclerosis. Hence it is important to have routine eye examinations even if you think your vision is fine. Examinations are recommended beginning at 6 months of age, 3 years old, and yearly thereafter. Adult examinations are recommended every 2 years unless otherwise advised by your optometrist, while senior examinations should be performed on a yearly basis. Our office is pleased to offer a wide range of contact lens services including lens fittings, practical training for new contact lens wearers and follow up care. Exciting advances in contact lens research enable more patients to enjoy the benefits of contact lens wear, including those patients who require bifocal or astigmatic correction. We offer fittings in a variety of soft, astigmatic, bifocal, coloured and RGP contact lenses. We also stock popular brands of contact lenses for easy, convenient pick-up. Please call or email the office for a consultation. Our optometrists co-manage with many ophthalmologists at the laser centres for both pre- and post-surgical examinations. The choice to have laser surgery can be an overwhelming decision. Our optometrists are knowledgeable in the latest advances and technologies in laser eye surgery and are trained to assess whether you are a preliminary candidate for Laser Vision Correction (Lasik). We work directly with all the major laser eye centers in the GTA, including TLC, Bochner and Herzig, and provide you with your follow up care after surgery. We can help provide information and answer any questions you may have regarding surgery. Our doctors will be happy to discuss if you are a candidate for Lasik during your scheduled eye examination or may suggest an alternative surgical procedure. Changes do not affect those with medical conditions or diseases affecting the eyes (cataract, glaucoma, macular degeneration…etc). Individuals with one of these eye conditions are covered for annual eye exams under OHIP.